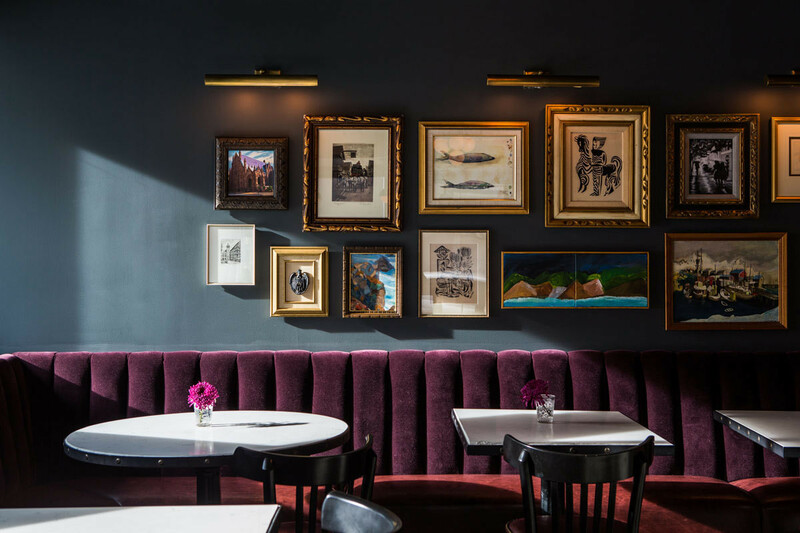 An aubergine-velvet banquette and slate-hued wall make for a cinematic backdrop at Pennyroyal, the bar at Seattle's Palladian hotel. The hotel's revamped 1910 brick facade. The Gore-Tex-loving birthplace of Amazon, Starbucks, and Kenny G might not be the first spot you’d expect to find a fashionable retreat. 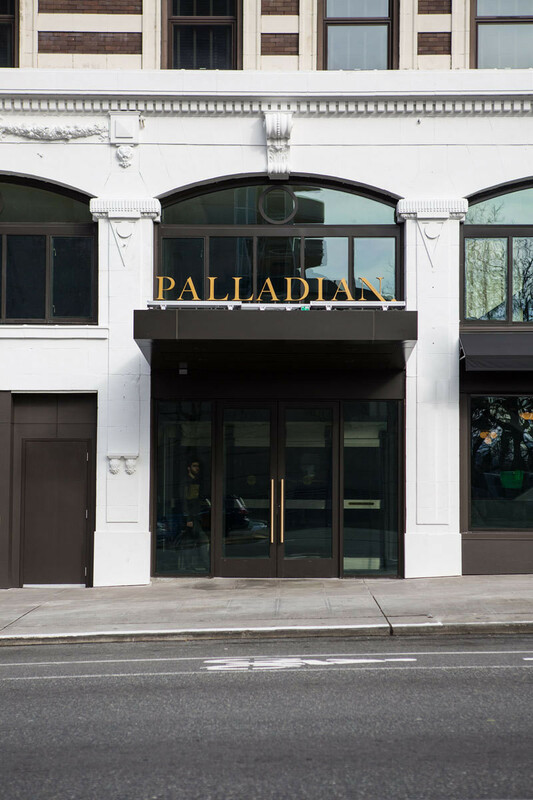 But that’s precisely why Seattle needed the Palladian, a new boutique hotel that, at the outset, seems better suited to the sexier enclaves of New York or Los Angeles than the Emerald City. 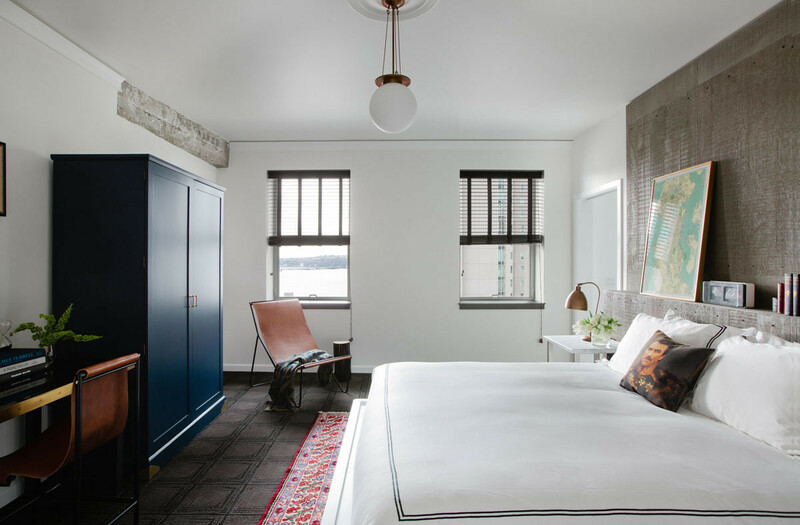 “My wife and I love this type of hotel,” says David Cohanim, developer and owner of the Kimpton Group property. But while they sought to create a destination that more closely resembled the lodgings where they like to stay on their travels, they also stuck to a homegrown perception of a space grounded in its setting’s history. 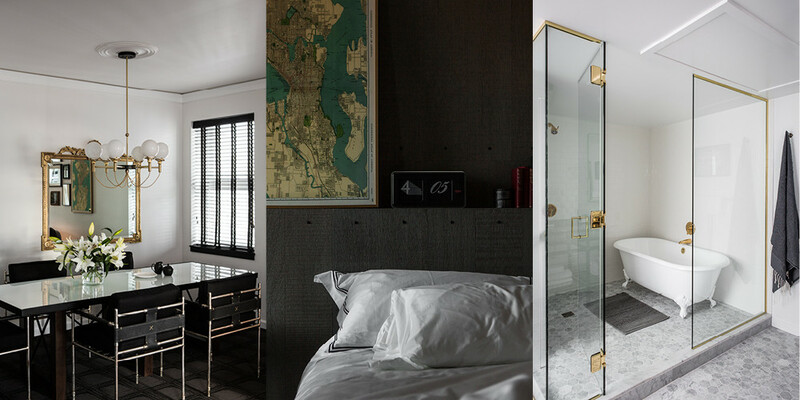 To bring his vision to life, Cohanim enlisted San Francisco interior designer Nicole Hollis to infuse a 1910 brick building with her signature moody-glam aesthetic, complete with dark walls, metallic finishes, and rich texture. Inspiration came from a visit to the Museum of History and Industry, where the design team made note of the city’s most transformative events, from the beginning of Prohibition and the lumber-and-logging boom to the Great Seattle Fire of 1889. “I felt it was a good way to see how we could take the best parts of the city and reflect them in the design of the hotel,” says Cohanim. 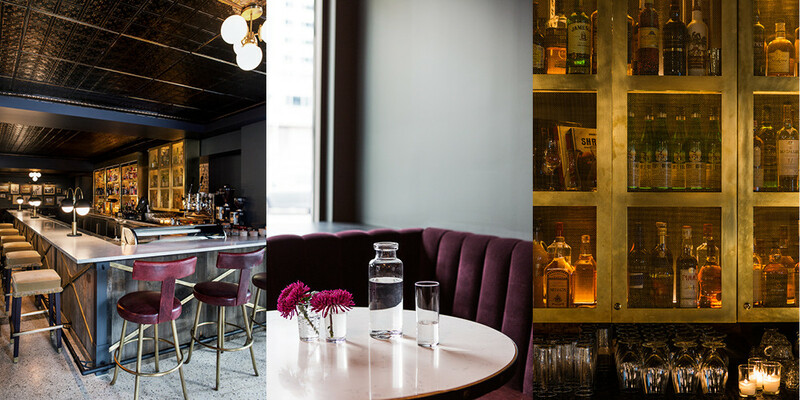 The bar area reflects Seattle history: wood touches recall the lumber-and-logging industry, while gilded details are a nod to the gold rush. For her part, Hollis did just that, retaining the structure’s original terrazzo marble floors, brick walls, and wood beams and supplementing them with sophisticated details: velvet curtains and sofas, brass and gold metalwork, and a color palette that reflects the city’s sylvan surroundings. 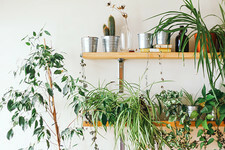 “We drew inspiration from the lush forests, the blues and greens in Puget Sound, natural wood from the timber industry, and a glimmer of gold in a nod to the gold rush,” says Hollis, before adding, “We also visited every whiskey bar and speakeasy in Seattle.” You can’t have too much research, after all. Each of the hotel’s 97 rooms ties in to the larger design concept. Riveted-wood wall panels create an unexpected headboard of sorts, adding a rustic touch to contemporary furnishings and lighting fixtures by Seattle-based Ladies & Gentlemen Studio. Suites blend era-appropriate elements—tufted-leather chesterfield sofas topped with ornately embroidered throw pillows, weathered maps of Seattle and its surrounding waterways, perfectly aged Moroccan rugs—with modern adornments, including streamlined leather sling chairs and mirrored surfaces. Guest rooms strikes a balance between rustic and contemporary: a period-style globe chandelier, vintage maps, and a claw-foot tub. 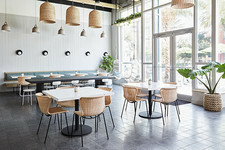 Covetable design pieces include leather sling chairs by Sit and Read, lighting by Ladies & Gentlemen Studio, and throw pillows sporting portraits of Tom Selleck and Chuck Norris. The whimsy continues in the public spaces, where similarly styled oil portraits of Dr. Frasier Crane—a Seattle institution played on television by Kelsey Grammer—and the musician Dave Matthews flank an original fireplace in the reception area. The paintings play off their surroundings in a way that’s at once disarming and oddly thought-provoking. “We were trying to achieve a place that promoted human interaction, contemplation, and connectivity,” says Hollis. Judging by the results, they’ve more than succeeded.